Environmental concerns • The board praises the research but says divestment from oil and gas funds not "the best method." Al Hartmann | Tribune file photo Students at the University of Utah walk near the Marriott Library building on the first day of Fall 2015 classes. 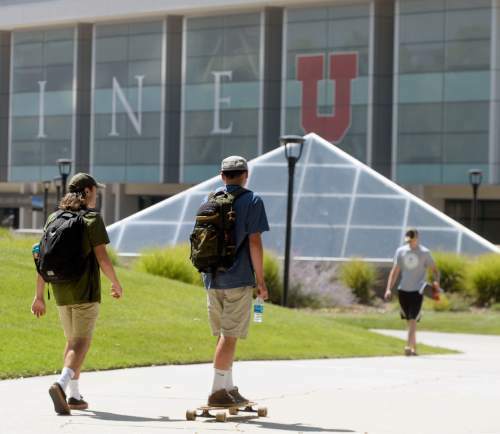 The University of Utah will continue to invest in fossil fuel equities, the school&apos;s board of trustees announced Thursday, despite recommendations by faculty members to divest shares in response to environmental pollution and climate change. In May, the University of Utah Academic Senate narrowly approved a resolution calling for the school to rid its investment portfolios of fossil fuels. But a statement from the board of trustees and U. President David Pershing dismissed that recommendation while praising the research and discussion of senate members. "Environmental challenges are multilayered and complex, which make them especially difficult to solve," the statement reads. "Like many other major universities around the country, we are not convinced that divestment from fossil fuel-heavy funds in the next five years, as the Senate has recommended, is the best method for addressing these challenges." The trustees added that they prefer to focus on positive investments that can be made, and expressed support for secondary recommendations from the Academic Senate to increase investments in socially responsible and environmentally sustainable options. The trustees received the senate&apos;s recommendations during their meeting May 10, and the trustees&apos; investment advisory committee was directed to review the issue. That committee met in June, according to U. spokeswoman Maria O&apos;Mara, resulting in Thursday&apos;s announcement. The advisory committee&apos;s meetings are not open to the public. The trustees are next scheduled to hold a teleconference Friday to elect leadership; their next regular meeting is set for Aug. 9. O&apos;Mara said it is unlikely the issue of divestment will be addressed during the August meeting. "I think this is as formal [an action] as there will probably be," she said. The issue of divestment generated significant debate among members of the Academic Senate. Some argued that investment in fossil-fuels conflicts with the U.&apos;s commitment to environmental sustainability, while others defended investment as necessary to preserve partnerships that could promote collaboration and research into alternative fuels and sustainable industry practices. The trustees&apos; statement concluded by describing climate change as "one of the most pressing and difficult issues of our time" and emphasizing the school&apos;s commitment to sustainability through research, teaching and operations. "Our efforts have benefited from longstanding relationships and continuing support from many entities, including the fossil fuel industry," the statement read, "and we appreciate their partnerships in addressing these difficult problems."